What are open riser stairs, and why are they so popular? An open riser staircase is one in which the “rise” –the vertical space between adjacent treads – is open, rather than enclosed. 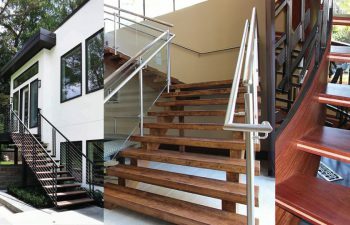 This construction offers unobstructed views between treads and the unique staircase design option is quickly growing in popularity, both in residential and commercial settings. The growing open riser trend is largely due to the transparency the design offers. Allowing daylight to shine through a staircase, the construction offers a modern and airy feel while also giving the perception of a larger space. Typically seen in contemporary staircase designs, the open riser option offers a modern and sophisticated look with an airy feel. Open riser construction is a versatile option and can be used across many staircase styles. Whether designing a residential or commercial staircase, open risers are a consideration for creating an open, well-lit space. With endless design options, they can be incorporated into both straight and curved staircases for interior and exterior projects. First, a beautiful curved residential staircase offers an interesting blend of solid and open features. 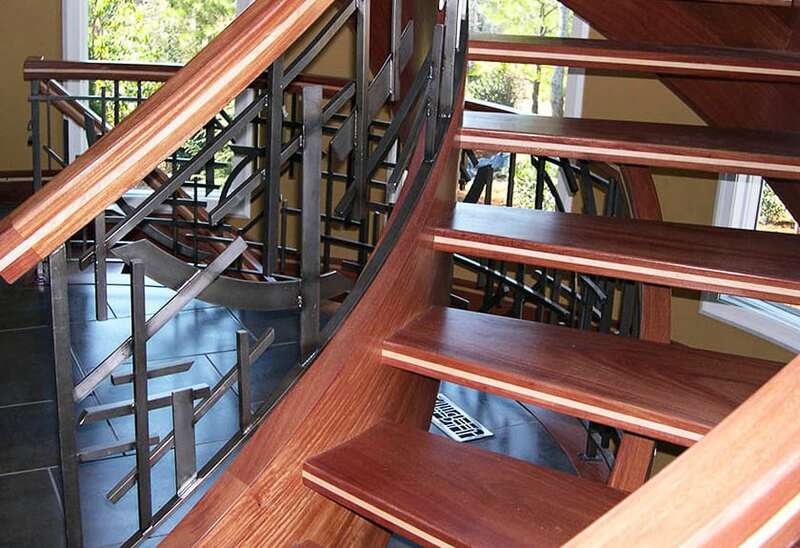 The wood treads and custom hand-welded wrought iron handrail system are offset by the airiness of the open risers. This unique staircase adds to the sophistication of a luxury residence. Next, a modern open riser staircase was constructed to complement the contemporary design of an apartment complex clubhouse. 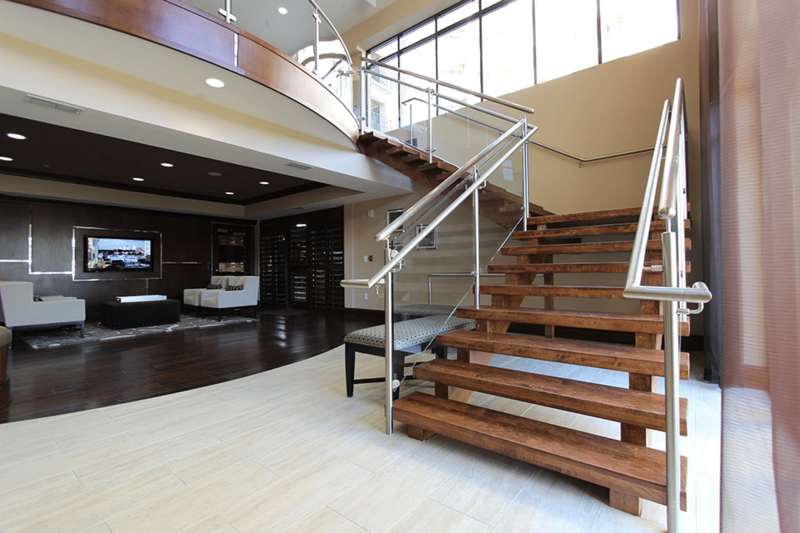 Featuring a glass and stainless steel handrail with dual wooden stringers and wood treads, this L-shaped stair system truly enhances the commercial space’s design. The open risers and glass features together offer increased transparency and even greater lighting. Open rise staircases are not only used within interior spaces; they are an excellent choice for exterior stairs as well. Below, a modern, straight mono stringer staircase enhances a building exterior with clean lines. 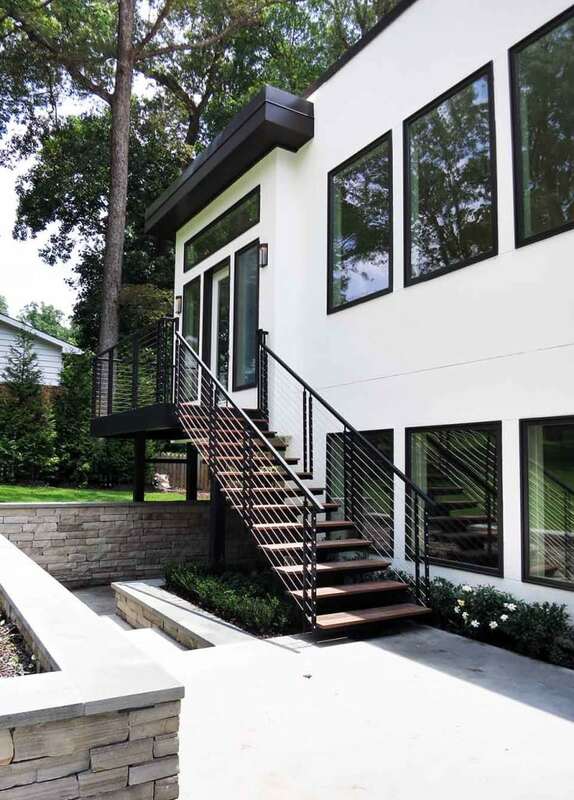 Steel cables accent the hand-forged metal handrail and newels, creating a high-end look. Are open riser stairs safe, and do they meet code? Both options ensure safety and enhance the aesthetics of the staircase, offering an added contemporary flare. Working with an experienced staircase builder is the key to ensuring that stairs are well-constructed and safe. Our outstanding team is committed to delivering the highest quality construction in every project. Visit our open riser stairs project galleries for additional details and pictures on our exquisite projects. From inspiration to installation our team is committed to designing and building the highest quality custom staircases. Our reputation speaks for itself and client satisfaction is our highest priority. Contact us today to discuss your next custom stairs project.